Is AI changing Maslow’s Pyramid of Needs? First, we have the basic needs for bodily functioning fulfilled by eating, drinking and going to the toilet. 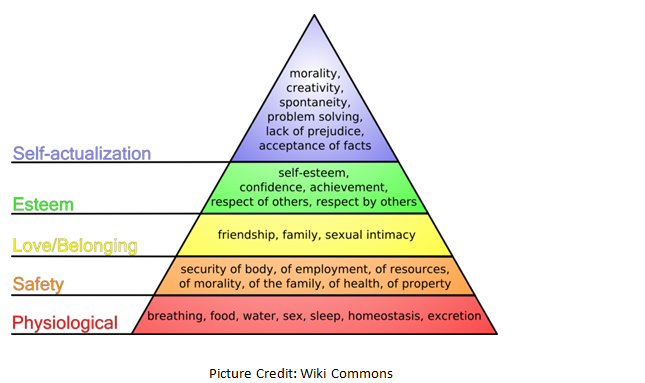 Maslow also included sexual needs in this group. Second there is the desire to be safe, and secure in the knowledge that those basic needs will be fulfilled in the future too. Third there is our need for love, friendship, belonging to a family, sexual intimacy and company with people of shared interests. Fourth there is the need for social recognition, self-esteem, confidence as well as status and respect by others. Abraham Maslow’s theory of human motivation, now over 80 years old, continues to have a strong influence on the world of business. Although the paper was written for psychologists, it has found its main application in management theory. According to Douglas Kenrick at Arizona State University, the appeal of Maslow’s hierarchy can be explained by the fact that it reflects a pattern of growth we observe in children. The theory seems intuitively right although there is little scientific evidence supporting it, which is one reason it continues to be criticized. Unlike the psychoanalysts and behaviorists who preceded him, Maslow was not that interested in mental illness. Instead of finding out what went wrong with people, he wanted to find out what could go right with them. This opened the door for later movements such as humanistic psychology. Humanistic psychologists believe that an individual’s behavior is connected to his inner feelings and self-image. Their perspective centers on the view that each person is unique and individual, and has the free will to change his or her lives at any time. According to their theory, humans have the innate (i.e. inborn) capacity for self-actualization, which is our unique desire to achieve our highest potential as individuals. In fundamental terms humanistic psychology encourages self-awareness and mindfulness. Because of this focus on the person and his or her personal experiences and subjective perception of the world, the humanists regard scientific methods as inappropriate for studying behavior. Artificial intelligence has a long history of hopes and failures in respect to our human perception what intelligent machines could accomplish. Spurred by the development of binary computers from 1945 onwards, the term ‘artificial intelligence’ was first coined in 1956 at a conference at Dartmouth College. AI’s founders were optimistic about the future: Herbert Simon from Carnegie Mellon University predicted, “Machines will be capable, within twenty years, of doing any work a man can do.” Marvin Minsky from MIT agreed “within a generation … the problem of creating ‘artificial intelligence’ will substantially be solved.” These predictions by highly regarded professors from top universities were totally overstated and it took over 50 years before AI regained its original momentum. The growing availability of massive computational resources for neural network and machine learning applications based on a growing library of sophisticated algorithms. Networked access to the massive and rapidly growing data pools (big data) representing knowledge mostly as unformatted data. The ongoing integration of Machine Learning and Neuroscience heavily funded by government initiatives. Machine Learning algorithms coupled with the analysis of ‘big data’ have successfully expanded the value of AI providing applications such as image recognition, natural language processing, autonomous driving or health analysis and medical support. The ‘explosion’ of science since the 1940’s, largely fueled by economic incentives, has resulted in an unprecedented expansion of scientific knowledge on an exponential trajectory. While this trend has attracted modern-day philosophers like Dennett, Chalmers or Searle to discuss the mystery of consciousness and its relationship to AI, the response of psychologists has largely remained at the behavioral and cognitive level joining forces with neuroscience research. Humanistic psychology and its focus on self-actualization has taken a back-seat and gone into sleeping mode. Science is a systematic endeavor that builds and organizes knowledge in the form of testable explanations and predictions about the universe. In contrast to the mainly empirical approaches of science the humanities use methods that are primarily critical, or speculative, and have a significant historical element. While the study of science is divided into a) fundamental science such as maths, physics, chemistry, biology or astronomy and b) applied science such as engineering, medicine, sociology and psychology there is no such distinction in humanities. Ancient and modern languages, literature, history, law, philosophy, religion, art and musicology are all part of the study of humanities. There are academic debates that psychology is not a science and should be viewed as part of the humanities. 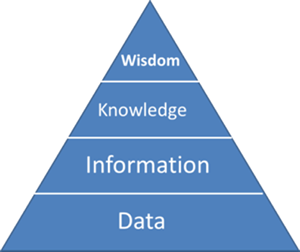 To understand the problem it is helpful to reference the well-known DIKW knowledge hierarchy where data and information are located at the bottom levels and subsequently organized into knowledge and wisdom at the top levels. What mainstream psychologists fail to realize is that the fundamental problem of psychology exists at the level of knowledge and wisdom and not at the levels of data and information. Religiously following the scientific method per se does not yield knowledge. It only yields data and information. As progress in machine learning will lead to the extraction of knowledge from data and information, psychology has the potential to become the gate-keeper of wisdom. Wisdom is one of those qualities difficult to define—because it encompasses so much—but which people generally recognize when they encounter it. And it is encountered for example in the realm of decision-making. Psychologists tend to agree that wisdom involves an integration of knowledge, experience, and deep understanding that incorporates tolerance for the uncertainties of life as well as its ups and downs. There’s an awareness of how things play out over time, and it confers a sense of balance which can only be acquired through experience. But by itself experience does not automatically confer wisdom. Only now are researchers beginning to look into the social, emotional, and cognitive processes that transmute experience into wisdom. Wisdom is different from intelligence. Intelligence seeks knowledge and seeks to eliminate ambiguity. Wisdom, on the other hand, resists automatic thinking, seeks to understand ambiguity better and grasps a deeper meaning of what is known but also comprehends the limits of knowledge. Monika Ardelt, associate professor at the University of Florida, is a modern wisdom researcher who has defined a 3 dimensional model of wisdom: cognitive, reflective and affective. The cognitive dimension includes the desire to deeply know and understand things, including the limits of our knowing. The reflective dimension represents the capacity for self-reflection, and the capacity to see things from many perspectives. The affective dimension of wisdom is empathy and compassion. So a wise person is one who desires to deeply understand things, who is humble and aware of the limitations of knowing, who can see things from many perspectives and avoids black and white thinking, and who radiates compassion. As machine learning coupled with ‘big data’ generates knowledge accessible anytime and anywhere thereby providing intelligence as a commodity to anyone, we can conclude that the hierarchy of needs no longer represents the motivation towards a fulfilled life. Humanistic psychology has to reinvent itself not as a science but as part of humanities and the humanitarian tradition. Our intense focus on scientific progress and our fascination with artificial intelligence might lead to a one-way street that potentially could end up in the destruction of humanity as described in science fiction movies. However, learning and experiencing both worlds -science and humanities- will set free the energy, joy and creativity needed to lead us towards a positive vision of life. Incorporating AI as a scientific tool to enhance our existence coupled with humanitarian self-awareness and mindfulness is likely to support this vision. Maslow’s hierarchy of needs is replaced by a horizontal model of collaboration between science and humanities. To support that direction our educational concepts both in school and at home have to change, giving humanities a much stronger presence. With all due respect, ‘Critical Thinking’ initiatives as offered by the ETH Zurich come too late; we have to start right after kindergarten.